By Jason Johnson on	 March 25, 2019 Congrats! “I always wanted to test boats with a Hall of Famer.” That’s what Shaun Torrente lightheartedly posted on his Instagram page as we set out to run an MTI 340X during the late-August Speedonthewater.com Mercury Racing Verado 400R Sport Cat Roundup on Missouri’s Lake of the Ozarks, two days after I was inducted into the Lake of the Ozarks Shootout Hall of Fame. Little did I know I was testing boats with the eventual Union Internationale Motonautique 2018 Driver of the Year, one of the highest honors a boat racer can achieve. I’d tested boats with world champions before—Steve David, Bob Teague and John Tomlinson—but none of them to my knowledge were named UIM Driver Of The Year during the time I shared a cockpit with them in my Powerboat magazine days. So, after winning two world titles in the same season, I can now say I get to test boats with the Driver Of The Year. It’s even posted on my Instagram page to prove it along with a picture of him on the cover of the Speed On The Water 2018 Year In Review magazine. Unintentional as it may be, it was cool that the 2018 Driver Of The Year was driving the MTI 340X that graced the cover of the collector’s edition magazine. In all seriousness, the recognition couldn’t have gone to a more deserving person, in my opinion. And based on the images and videos I saw from Saturday night’s 10th annual UIM Awards Giving Gala at the iconic Salle des Etoiles, Sporting Monte-Carlo in Monaco, the Italian affair in which they met Albert II, Prince of Monaco, was an evening Torrente and his wife, Flavia, are never going to forget. 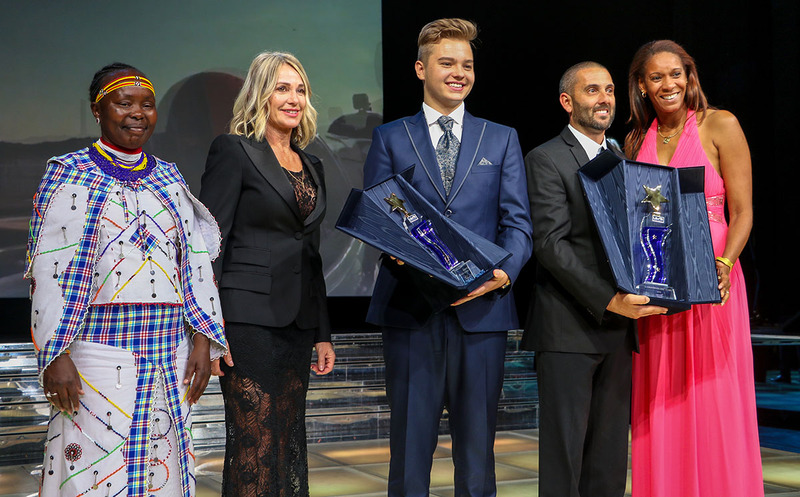 Along with Stefan Arand (center), who took home the Junior Driver Of The Year award, Shaun Torrente was presented his Driver Of The Year trophy by Cuban volleyball Olympian Yumilka Ruiz (right), Kenyan long-distance track and road runner Tegla Loroupe (left) and five-time Olympic Gold medalist Nadia Comaneci. Along with posing for pictures, taking care of media interviews and collecting his trophies for winning the hard-fought F1 H2O World Championship driver points title and team championships, as well as the team title in the abbreviated XCAT World Series season, Torrente was honored with the prestigious Driver Of The Year award, which was presented to him by five-time Olympic Gold medalist Nadia Comaneci, Kenyan long-distance track and road runner Tegla Loroupe and Cuban volleyball Olympian Yumilka Ruiz. Torrente, who is focused on defending his F1 H2O title starting later this week in Saudi Arabia (read about it in his recent Speed On The Water magazine column), made sure to thank everyone who has supported him along the way, especially his family. He said his teammates were the main reason he was even in a position to have so much success. 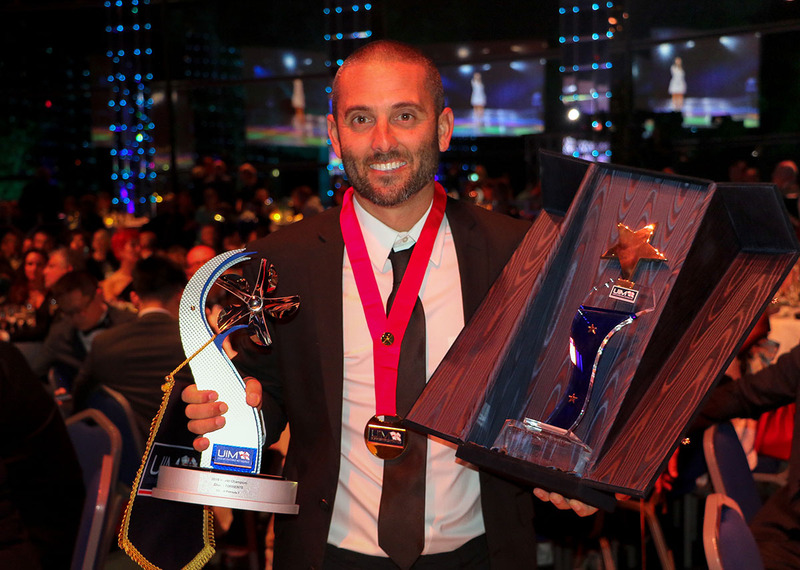 Team Abu Dhabi collected a plethora of awards for its superb 2018 UIM racing season. Torrente said it was also neat to see Sheikh Dr. Sultan Bin Khalifa Al-Nahyan, advisor to the Head of State and chairman of the board of directors of the Abu Dhabi International Marine Sports Club, receive the prestigious Stefano Casiraghi Memorial Trophy, in special recognition of his services to the sport and overseeing the progress of Team Abu Dhabi into a major force in UIM sport. The award was handed out in the presence of Albert II, UIM President Raffaele Chiulli and many VIPs and distinguished guests. 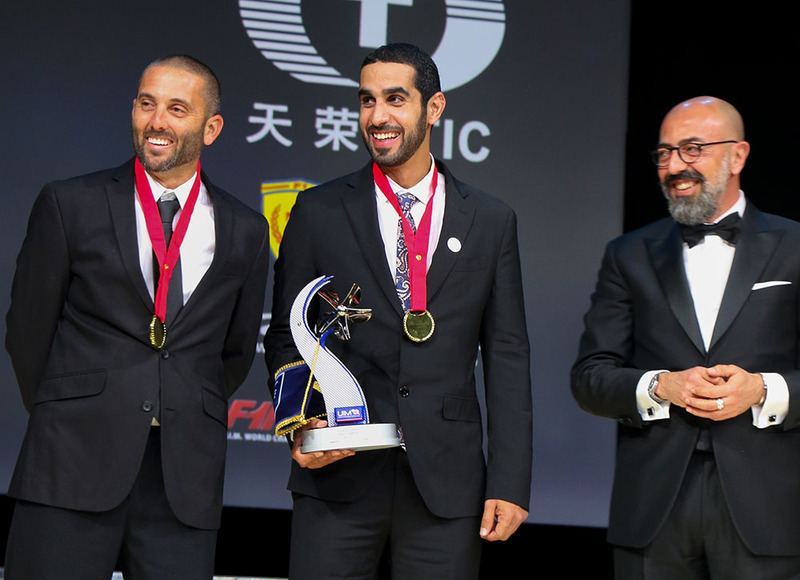 Torrente and Faleh Al-Mansoori (center) were awarded the gold medal for their UIM XCAT World Championship success. And while Torrente couldn’t help but think of his teammate Antony Del Pin—the 25-year-old Team Abu Dhabi engineer who died several days earlier in a motorcycle accident—he did his best to enjoy the night as much as possible. He plans to take a similar approach this season and enjoy every bit of it, because, even when he won races in Portugal, India and China in 2018, he didn’t really enjoy them. He said he was more relieved than happy since he was just trying to get to that goal of winning the championship. Now, Mr. Driver Of The Year—that’s officially his name until someone takes it from him this time next year—can soak it all in a little more.